The legendary rock band Aerosmith is scheduled to play at the Cheyenne Frontier Days Rodeo (CFD) in Cheyenne, Wyoming, on July 22, 2015. In SHARK’s considerable experience of more than two decades, CFD is the most brutal and deadly rodeo in the world. SHARK has documented one horror after the other, with many animals severely injured or killed. Our Aerosmith petition currently has just over 2,270 signatures. We need tens of thousands of signatures, if not more. IF YOU HAVEN’T SIGNED THE AEROSMITH PETITION YET, PLEASE DO SO NOW, AND SEND IT TO YOUR FRIENDS, ASSOCIATES AND RELATIVES AS WELL!!! If Aerosmith withdraws from the rodeo, it will send a shock wave across two worlds - the world of rodeo, and the world of entertainment. 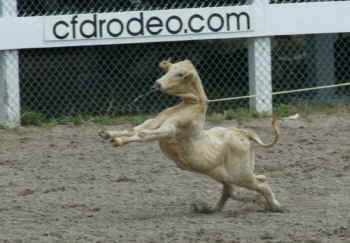 Please don’t let rodeo victims down, when doing something for them is as easy as signing a petition! Watch our video asking Aerosmith to cancel their performance. CFD, like other rodeos, uses the attraction of rock bands to subsidize their cruelty. That’s why we are asking caring fans of Aerosmith to encourage the band to cancel its show. SHARK has documented and exposed rodeos across the United States for more than two decades. In our experience, the Cheyenne Frontier Days Rodeo is the most cruel and deadly rodeo in the world. Every year, horses, calves, steers and bulls are brutalized at the Cheyenne Frontier Days Rodeo. Some of those animals are injured, and some are even killed. You can find what we have discovered at www.ShameOnCheyenne.com. Performing artists across the country have been saying no to animal cruelty. Whether it is the string of big names that have said no to performing at SeaWorld, or the past performers who have cancelled on Frontier Days, it is clear they are hearing voices from across the country who believe animal cruelty is wrong and must not be supported. Let's be sure Aerosmith hears those voices too. Aerosmith is a legendary rock band whose name shouldn’t be fouled up by animal cruelty. Join us in asking Aerosmith to withdraw from the Cheyenne Frontier Days entertainment lineup. Please sign and share the petition today.